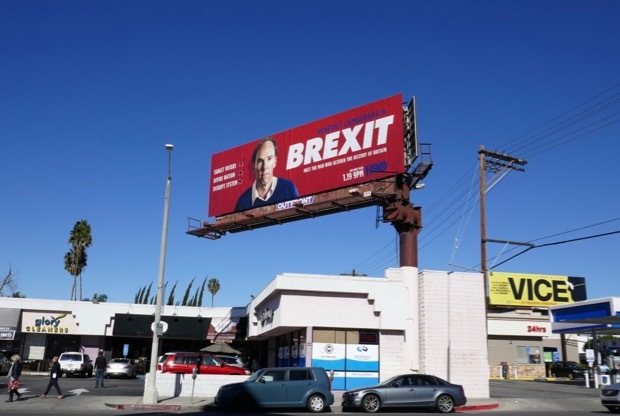 Disinformation, propaganda and Russian interference, two things that the 2016 U.S. Presidential Election and Britain's referendum vote on Brexit (exiting the European Union) have in common. Just like with the election of Donald Trump, no one really thought the British public would vote to leave the E.U., but the U.K. government did a poor job of communicating the dire consequences of leaving whilst the pro-leave contingent lied about windfalls of millions of pounds for the National Health Service and helped spread hate, division and intolerance about immigrants in the same way Trump campaigned in the U.S. with his wall rhetoric. 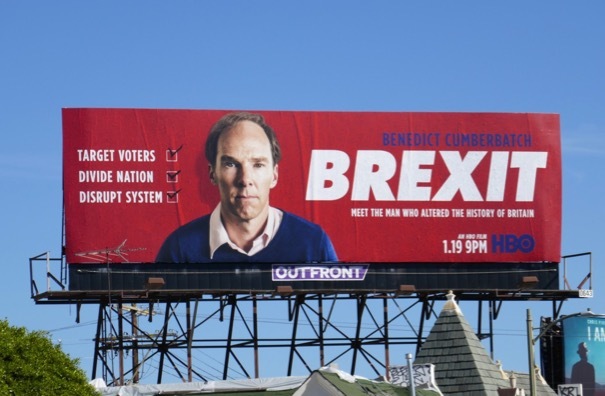 One of the chief architects of the Vote Leave outcome was political strategist Dominic Cummings who is played by Benedict Cumberbatch in the new HBO docu-drama. 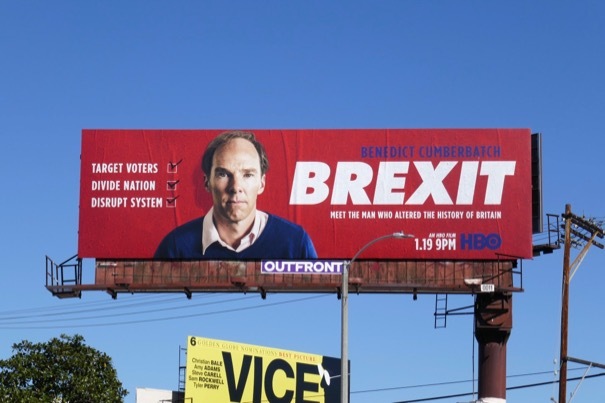 These HBO movie billboards were snapped along Beverly Boulevard and Pico Boulevard from January 18 to January 21, 2019. 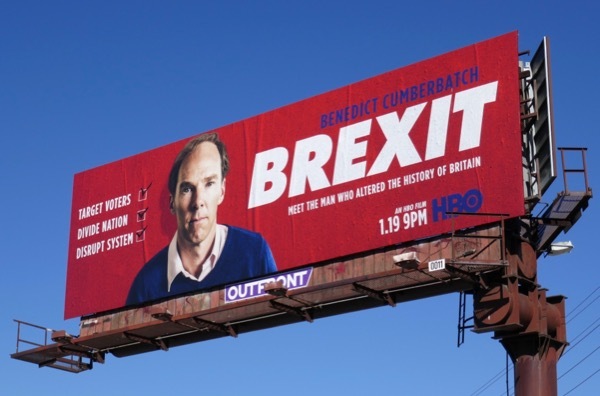 No stranger to playing controversial characters, Benedict Cumberbatch can also be seen as Julian Assange in these movie billboards for The Fifth Estate and looking shifty in these Patrick Melrose billboards, whilst more heroic in these Doctor Strange billboards. 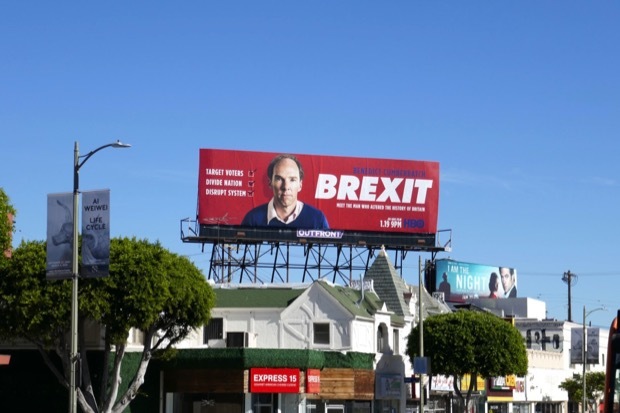 With politicians suggesting no real end in sight to the crisis in Britain and the American government still shut down, Daily Billboard is sure when we look back at history in the future the words Brexit and Trump won't be fondly remembered.